The number of US public companies (that is, companies with stock traded on a public exchange and owned by those shareholders) has dropped by half in the last 20 years. Part of the reason is a slowdown in the rate of start-ups; part is a rise in mergers and acquisitions of existing firms. In the next few months, these forces will be playing themselves out in the markets for seeds and agricultural chemicals. 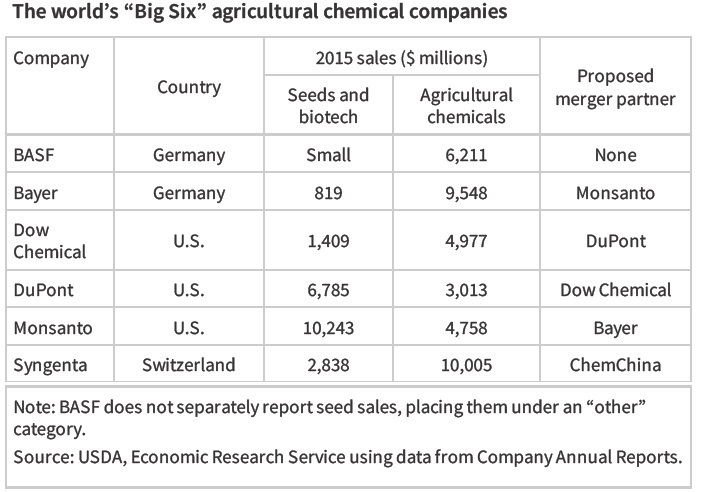 James M. MacDonald discusses one arena in which these forces are playing out in "Mergers and Competition in Seed and Agricultural Chemical Markets," published in Amber Waves from the US Department of Agriculture (April 3, 2017). 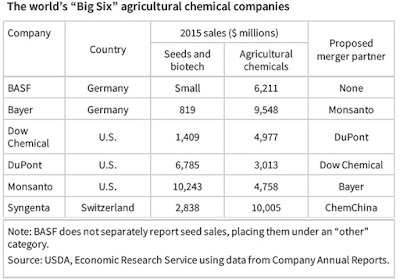 As MacDonald explains, the global economy currently has a "Big Six" of agricultural chemical companies. However, Dow Chemical and DuPont have announced a plan to merge, and Bayer has announced a plan to buy Monsanto, which would reduce the Big Six to the Big Four. At the same time, a state-owned Chinese chemical company called ChemChina has made an offer to buy Syngenta, another one of the Big Six. So here's the current industry, and the proposed transactions, in a table. seed and agricultural chemical businesses." But now that the Big Six has happened, markets for specific seeds are not surprisingly quite concentrated. For example, here are four-firm concentration ratios (that is, the share of sales by the largest four firms) in US production of corn, cotton, and soybeans, for 2000 and 2015.. The standard set of arguments applies here. Firms involved in mergers always promise "synergies," and in particular, the promises here often argue for a more effective research and development effort. Those who buy the products are more worried that less competition will mean higher prices. "U.S. antitrust enforcement agencies rarely cited innovation concerns in merger challenges through the early 1990s, but they have been increasingly likely to do so since then and have introduced innovation concerns into merger challenges in agriculture. In 2016, the U.S. Department of Justice challenged the purchase of Precision Planting, LLC, by John Deere on the grounds that the acquisition would reduce innovation in high-speed planters. John Deere and Precision Planting, a unit of Monsanto, are the two major producers in this nascent industry. After many years of research, during 2014 each firm introduced high-speed planting systems that allow row crop farmers to substantially increase planting speeds at no cost in accuracy. While the Deere system was bundled into new planters, the Precision Planting product could be sold as a set of components and retrofitted onto existing planting equipment, including Deere’s. The Department argued that intense rivalry between the two led to improved prices for farmers and to the rapid introduction of innovative new features, and that the merger would eliminate that competition." I can't claim to have made any intensive study of these proposed mergers. But when an industry is already quite concentrated and profitable, my bias is that proposals for further mergers should have some very high hurdles to cross. It will be interesting to see how the antitrust administrators under the Trump administration address this industry.